• You can’t ignore it. • It can’t be turned off like television. •It reaches drivers and passengers no matter what radio stations they’re listening to. • The large, colorful, innovative designs demand attention. • You have exclusivity in your space. We have teamed up with Panhandle Transit, a division of Panhandle Community Services, to increase revenues by selling advertising on their buses and vans that roll through Amarillo and the Panhandle daily. 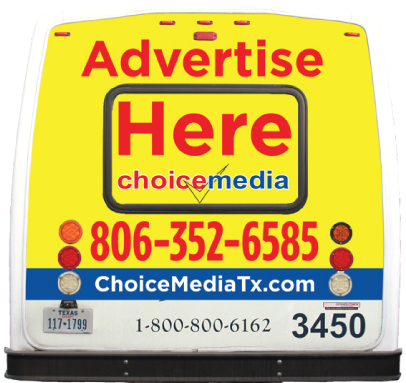 This is a boon to local communities, businesses, events, etc., by bringing more exposure to their product lines by placing ads on the back and sides of the buses. It’s A rolling billboard that carries the message and product lines that “move” your brand in view of potential customers.